As much as we hated leaving Cape Breton Island so soon, we were also excited about what we'd find in the Halifax area of the province. 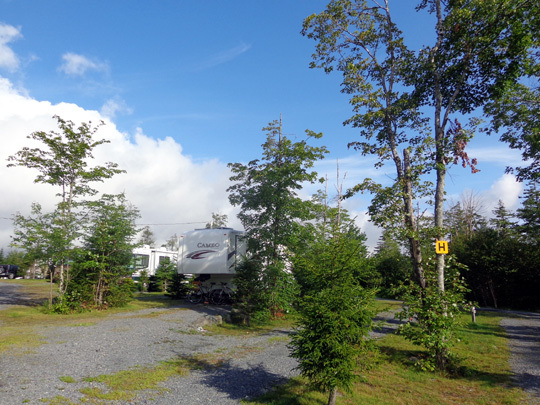 We have reservations at a campground in a suburb north of Halifax for the next seven nights and it will serve as our base to explore the central Atlantic coast side of Nova Scotia. 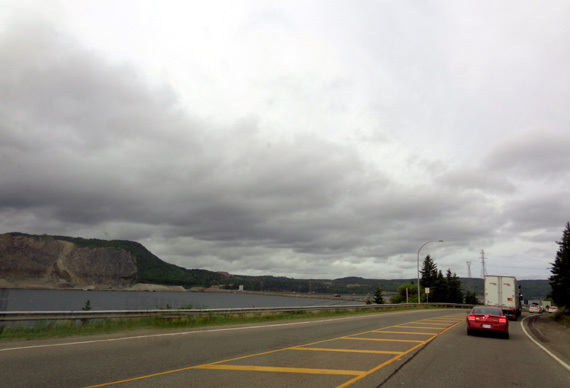 Strait of Canso at Port Hastings; this strait separates Cape Breton Island from the mainland. Route: West on CA 105 and CA 104 to Truro. South on NS 102 to the Dartmouth-Halifax area. 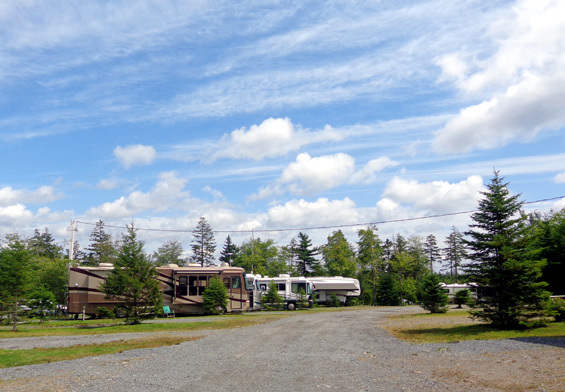 West on NS 213 to Woodhaven RV Park in Hammonds Plains in the northern 'burbs of Halifax. 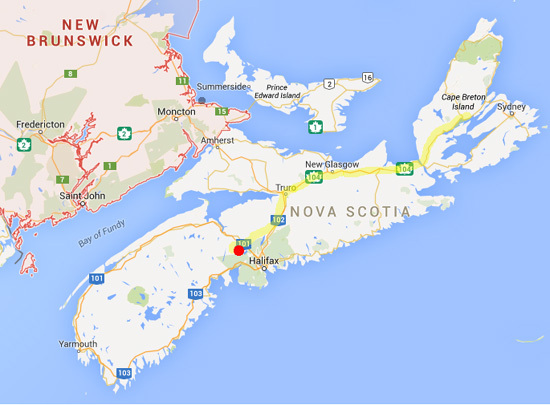 Traffic and road conditions: Traffic was moderately heavy the whole way, even on Cape Breton Island. Parts of the route were freeway, parts two-lane with good passing lanes up hills. Most road surfaces were good, although some bridges were rough. There was no road construction. Weather: We knew Halifax and southern Nova Scotia were supposed to get 1-2" of rain today. We were pleased that the road was dry and it was partly sunny until we got to New Glasgow, about 1/2 the distance. We had rain off and on until we got to Truro. From there south it poured pretty heavily. 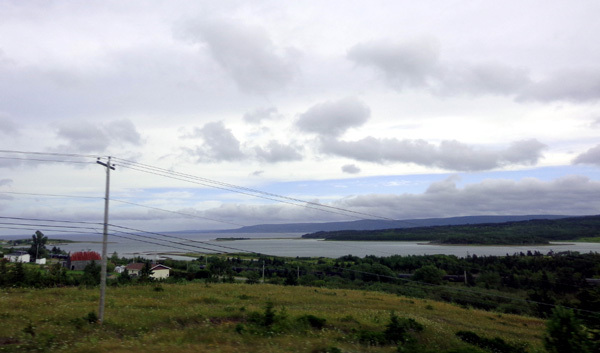 View of Cobequid Bay from Truro; this bay is the NE finger of the Bay of Fundy. Fortunately, the rain was just a drizzle when we got to the RV park and set up the camper. It continued for about an hour, then quit. According to the local evening news, there was quite a storm in the Halifax area in the morning. We're glad we missed most of it. We originally found this campground during an internet search and made our reservation while we were in New Hampshire. We found Woodhaven easily with our GPS. Check-in was quick, although the fella manning the desk wasn't nearly as sociable or helpful as the folks at the Baddeck Cabot Trail Campground. We paid $248 CA in cash for one week (seven days for price of six = $35.43/night) for a full hookup site with 30-amp electricity. Our actual cost in U.S. money was less. We were assigned a particular site but it was occupied when we got there. Jim called the office and the guy said to take any site we wanted on that row near the back of the campground. We took a pull-thru site two spaces over. The sites in our row are double-long with hookups behind us on the opposite side of the site for a back-in or pull-thru from the other direction, but they don't have much space between them. It's the first time we've seen that configuration. Fortunately, during the time we were here (one week) we had next door neighbors on our doorside for only one night. No one ever parked behind any of us on our row during the week we were here. Most sites are gravel with grass. Ours is on a sideways slant, which made leveling a bit more difficult but at least water doesn't accumulate under or near the camper. 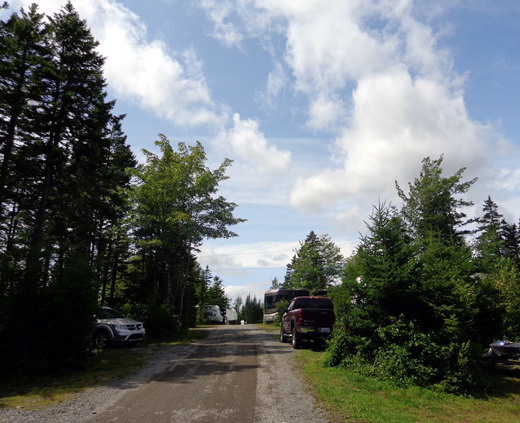 We like the location of our site at the back of the campground. It is quieter with less traffic and we're close to woods and a trail where we can let the dogs run loose. We initially had a problem with the campground's WiFi. Even though we are very close to a WiFi pole, neither of us could get online until Jim spent several minutes on the phone with the company that provides the service. After that we got on easily and had a good signal. Our phone signal is also strong (five bars) and we can get two local TV stations clearly for news and other programs. 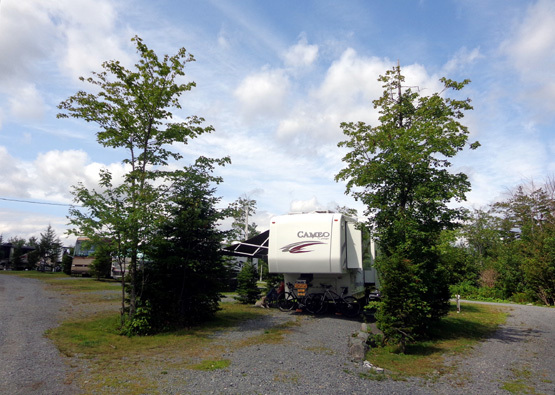 The RV park is quite large and has two laundry rooms, two rest rooms, two playgrounds, a pool, a store, and a rec room. There is also a large grassy field where Jim can play ball with Casey. During our stay she got to meet and play with several large dogs. The park was about 3/4 full on the weekend we arrived and half full on weekdays. 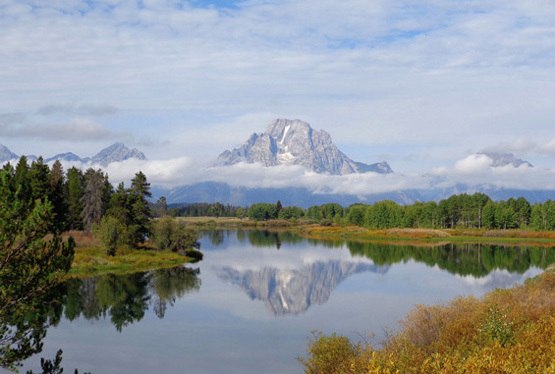 There are a good number of seasonal folks from warmer climes in the States -- the opposite of snowbirds -- as well as Nova Scotia residents who are here on vacation or just for the weekend. We've met some interesting people here this week. 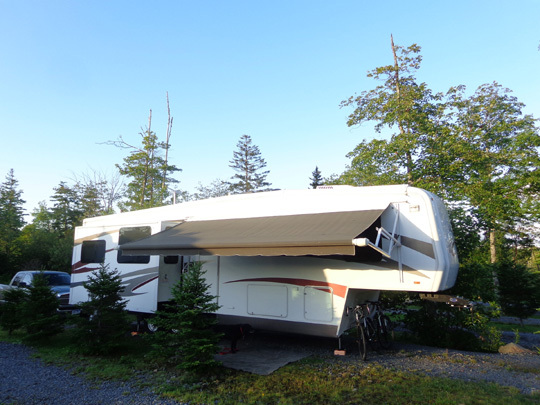 For more information about Woodhaven RV Park, click on this website. After lunch and getting settled in on our arrival day we drove about 10 miles to the nearest Walmart. It's listed online as a super-store. Among other things, I found milk significantly cheaper than in Baddeck ($5.67 CA here for 4 liters, which is more than a gallon, so the price isn't so terrible with our lower American exchange rate). There is no sales tax on food in Canada. Like Walmart, other big box stores where we shopped in Halifax have some American brands and some Canadian brands. We often buy store brands so we aren't afraid to try Canadian brands that are new to us. It's all part of the fun of traveling to another country!